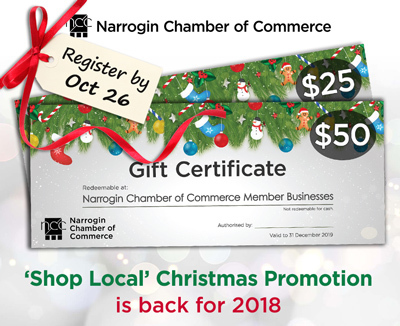 The Chamber will again be running the 'Shop Local' Promotion in the lead-up to Christmas 2018. Last year 28 businesses participated, and since 2009 over $74,000.00 worth of vouchers have been spent by local shoppers in our region! Participating businesses are encouraged to cross-promote both their individual services and other participants throughout the campaign. To be a part of this extremely popular promotion please register below by 26th October 2018. Participants will be required to pay $300.00 by 2nd November 2018. For more information, contact Kerry on 0428 812 607 or admin@narroginchamber.com.au.